That headline about Starbucks taking Bitcoin struck me as a little odd, since I distinctly remember that Howard Schultz, the executive chairman of Starbucks, said back in January that “I don’t believe that bitcoin is going to be a currency today or in the future”. Indeed when I looked at the actual story I realised that it was, as you probably suspected, not true. And, what’s more, just a couple of days later I read that “Starbucks has clarified that it will not be accepting Bitcoin (BTC) or other cryptocurrencies as payment”. As I suspected. Reading further into the announcements we get down to the the brass tacks. Starbucks has no intention of accepting Bitcoin at retail point of sales (and nor, I imagine, does any other Main Street retailer). Starbucks said that they will play a “pivotal role” is developing applications “for consumers to convert their digital assets into US dollars”. Note the specifics: to convert cryptocurrencies into US dollars. What was actually being announced was, essentially, a plan to find a way of loading Starbucks wallets from Bitcoin accounts. In other words, the conversion from Bitcoin into Starbucks private currency. Bitcoin to Starbucks Stablecoin, if you like, since Starbucks guarantees to redeem their private dollars at par with US dollars, so long as your redeeming them in order to buy coffee or a variety of other soft drinks, bottled waters and snacks. Now, earlier in the year Jeremy Light, who knows what he is talking about, made the evolution of retailer wallets central to his predictions for change in the payment sector this year. He said that these wallets – for both online and in-store purchases, where I expect to see convergence – will spread “emulating the success of Starbucks and Walmart” by focusing on slick checkout. I think Jeremy is right about this and that’s what makes the Starbuck announcement mildly interesting, because a convenient mechanism to load retailer wallets from cryptocurrency accounts would actually make the use of them more attractive. There is no point try to extend Bitcoin acceptance at point-of-sale. That’s not what is was designed for and it makes no sense from a strategic perspective for retailers to mess around with in-store systems, service and acceptance to accommodate Bitcoin, Ethereum, DogeCoin or anything else. However, having online mechanisms to load the retailer wallets is a different proposition, because the point-of-sale systems only need to be modified once (to accept the wallet) and the any number of back-end conversions can be explored without requiring further front-end modifications. That’s a win-win for the retailers and for the cryptocurrency users. ………..the second Consult Hyperion seminar on………. ………….. D I G I T A L … M O N E Y ……………. Keynote Address: European Multiple Currencies Sir Richard Body, M.P. Digital Money is a Social Issue David Birch, Director, Consult Hyperion. The European Digital Money Picture Dag Fjortoft, Deputy General Manager, Europay International. Telecommunication Service Providers as Payment Operators Norman Bishop, Product Manager for Micropayments and E-Cash, BT. Retailing and Digital Currencies Paul Arnold, Head of Tesco Direct. Transforming Businesses with Digital Money John Noakes, Business Manager for E-Commerce & Supply Chain, Microsoft UK. A Legal Pespective on Digital Money in Europe Conor Ward, Partner in Computers, Communications & Media, Lovell White Durrant. A View from the European Commission Philippe Lefebrve, Head of Sector in Financial Systems, European Commission DGIII. The Technologies of Digital Money Marcus Hooper, Principal Payments Technologist, IBM United Kingdom. Visa and Digital Money Jon Prideaux, Executive VP New Products (EU Region), Visa International. Making Digital Money Work. Tim Jones, Managing Director of Retail Banking, National Westminster Bank plc. Experiences from an Operational Micropayment Scheme Nigel Moloney, Senior Manager in Emerging Markets Group, Barclays Bank. Mondex: A Status Report Victoria Mejevitch, Mondex Product Manager, Mondex International. The Common Electronic Purse Specification (CEPS) Daniel Skala, Executive VP for Sales, Proton World International. Bitcoin is going off the rails, but so what? Number goes up, number goes down. Cryptocurrencies as a whole have been tumbling, and the original cryptocurrency, Bitcoin, is no different. It looks as if there was a bubble and it is bursting. The economist John Kay is unconvinced that this bubble will lead to anything. He wrote that “the underlying narrative of cryptocurrencies is, by the standards of historic bubbles, unusually weak; more akin to tulips than to ultimately transformational innovations such as railways or electricity” going on to observe that the “power of the current narrative is that it brings together so many features which make for an attractive and infectious story” which I think is congruent with some observers’ view of Bitcoin as a protest movement rather than a financial revolution. I have a suspicion that John may be wrong though. I think Bitcoin will have an impact and that it will lead to the creation of new markets. His mention of the railways reminded me of Nouriel Roubini and Preston Byrne’s observation that that the cryptocurrency mania of today “is not unlike the railway mania at the dawn of the industrial revolution in the mid-19th century”. I’d put the dawn of the industrial revolution a little earlier than that, but The Black Swan and The Black Marmot are on to something here and to see why you need to know a little about that railway mania that they refer to. By A.B. Clayton, Public Domain. I wrote about it some years ago for Financial World magazine (back December 2011 in fact) and made the point that Victorian Britain’s railway boom was truly colossal. The first railway service in the world started running between Liverpool and Manchester in 1830 and less than two decades later (by 1849), the London & North Western railway had become the Apple of its day, the biggest company in the world. This boom led to a colossal crash in 1866. The crash was caused (here’s a surprise) by the banking sector, but in that case it was because they had been lending money to railways companies who couldn’t pay it back rather than American homeowners who couldn’t pay it back. Still, then as in our very own crash of 2007, the government had to respond. It did so by suspending the Bank Act of 1844 to allow banks to pay out in paper money rather than gold, which kept them going, but they were not too big to fail and the famous Overend & Gurney bank went under. When it suspended payments after a run on 10th May 1866 (as frequently noted, the last run on a British bank until the Northern Rock debacle), it not only ruined its own shareholders but caused the collapse of about 200 other companies (including other banks). The railway companies were enormous and many ordinary people had invested in them. When their Directors went to see the Prime Minister in 1867 to ask for the nationalisation of the railway companies to stop them from collapsing (with dread consequences for the whole of the British economy and in particular the widows and orphans who had invested in them) because they couldn’t pay back their loans or attract new capital, they didn’t get the Gordon Brown surrounded by advisers who happened to be bankers tea and sympathy followed by the suspension of competition law. Benjamin Disraeli told them to get stuffed: he didn’t see why the public should bail out badly run businesses, no matter how big they might be. 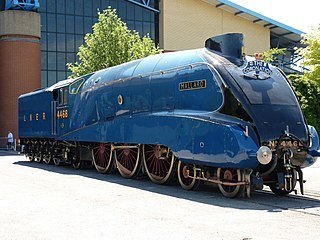 The Mallard, holder of the world speed record for steam locomotives, 126mph. Needless to say, the economy didn’t collapse. As you may have noticed, we still have trains and tracks. A new railway industry was born from the ruins, just as new cryptomarkets will arise from the ruins of Bitcoin. The transport services kept running because the new industrial economy needed them and that economy kept on growing. The new post-industrial economy needs a new transport network, for bits rather than iron and coal, and Bitcoin’s heirs and descendants might well provide it. The impact of the railway crash was not restricted to rail transport and the industries that used it, just as the impact of the Bitcoin crash will spread far beyond online drug dealing and mad speculation. As I noted in my book “Before Babylon, Beyond Bitcoin”, Andrew Odlyzko’s superb paper “The collapse of railway mania, the development of capital markets, and Robert Lucas Nash, a forgotten pioneer of financial analysis” argues convincingly that the introduction of basic corporate accounting standards following the collapse of the railway companies was a significant benefit to Britain and aided the development of Victorian capitalism. You can’t make an omlette, as the saying goes, without letting the bad eggs go to the wall. Hence, as I summarised more recently, the vital lesson of that crash is that letting the railways collapse not only led to a stronger railway industry but it also helped other industries as well, because it meant that new standards for accounting and reporting were put into place. This is hardly a novel observation. History has repeatedly gone through this cyclic co-evolution of technology, business and regulation to end with something pervasive and fundamental to the way that society operates, which is why I think Nouriel and Preston are right to use the comparison. Benoît Cœuré, chair of the Committee on Payments and Market Infrastructures (BIS), and Jacqueline Loh, chair of the Markets Committee (BIS) made a very good point about this in the FT writing that “while bitcoin and its cousins are something of a mirage, they might be an early sign of change, just as Palm Pilots paved the way for today’s smartphones”. This, I think, is the narrative that I find most plausible. But what are cryptocurrencies “paving the way” for? I think it is for cyryptomarkets that trade in cryptoassets: cryptocurrencies with an institutional link to real-world assets. These are markets made up from money-like digital bearer instruments or, for want of a better word, “tokens”. As I have written before, it is not the underlying cryptocurrencies that will be the money of the future but the “tokens” that they support. Assuming that the fallout from the Bitcoin bubble is better regulation of the platforms, then cryptomarkets based on tokens will aid the evolution of post-modern capitalism as much as the invention of auditing helped Victorian entrepreneurs a century and half ago.